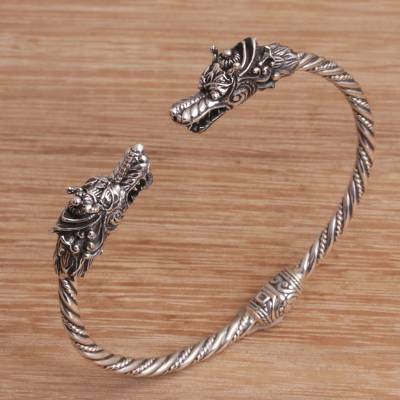 Two fearsome dragon siblings are crafted of sterling silver to gaze at one another from the ends of this Balinese cuff bracelet. Designed by Dewa Arimbawa, the bracelet is handcrafted by local artisans, who add intricate rope motifs along the band, accentuated with a striking combination of finishes. This accessory opens with a concealed hinge to fit the wrist. The dragon is very detailed. It is the best dragon face that I have seen. I am very pleased with this purchase! "Love to Wear This Braclet"